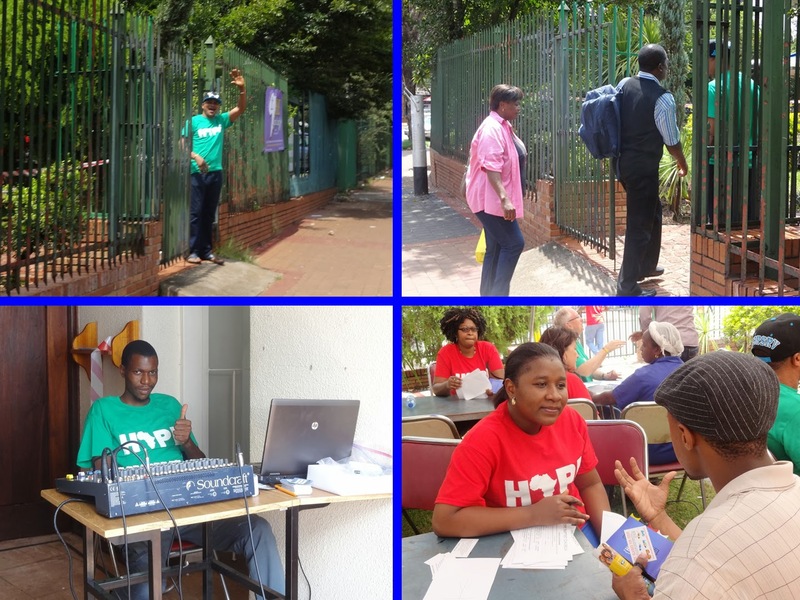 Day 4 - Outreach Continues in Pretoria! The highlights from today include over 600. 600 what, you ask? 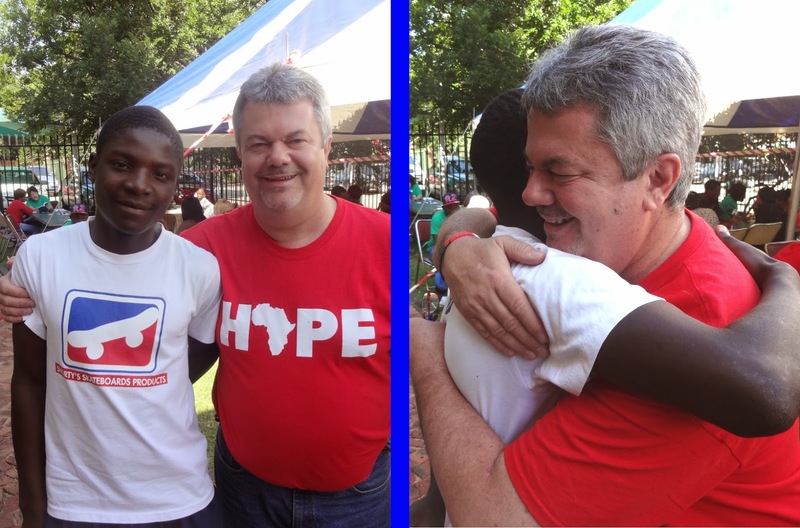 As many as 600 people who have heard the Gospel one-on-one in the Sunnyside community of Pretoria from yesterday until today! The number will only rise with each post you read throughout the week. member is displayed on the main street outside the church gates. Let us paint the picture for you. The church building (which is being rented from the Dutch Reformed, who still continue to use the church on early Sunday mornings and for youth programs during the week) is a landmark of the community. For years and years it has only been known as a "white" church, while the surrounding neighborhood of Sunnyside has become predominantly black. Since Hope Baptist Church began 2 years ago to outreach to the community, the activity has been growing, but most have not known that a church with a black pastor has been meeting there -- so the need to raise awareness is great. Pastor Julius said that in the past 7+ years he has been a part of the community there has never been a church to hold an event like Hope Baptist Church is holding this week. It is rather unheard of for churches to reach out to the community seeking to meet their needs. Through the leadership of Julius and Cintia, this barrier is being breached. and prayers taking place at one table! using a Bible with the 5 verses of the "Romans' Road" marked and easy to find. However, this is also a relationship-building opportunity. We could share with you many stories of people making decisions for Christ; others who are looking for stronger faith; others who pray for a life change because they know the path they are going down is destroying them. The list goes on. Walls are clearly being broken down just as we have been praying, and the work ahead for Hope Baptist Church will be monumental in the weeks and months to come as they followup with these hundreds of new contacts and people needing spiritual, physical and emotional healing. Praise for the way the community is being reached in practical ways. You should see the faces of some of these who physically cannot see very well and the way their eyes are open with amazement when they put on a pair of glasses that open up the world anew! Or think of the excitement of a small child who receives his first pair of sunglasses. this event with many new glasses to be seen around town! Today, we also praise God for the safe arrival of Katie's friend Busi who has joined our team from Zimbabwe for the remainder of our stay. Pray for the coming days as we continue to share. Pray for the jet lag that is still nagging at some of the team. Pray also for the safe arrival of Mitch McDonald as he joins us tomorrow evening. It has been an exhausting few days, yet we have many days of ministry yet to come! The emotional expenditures of sharing is sending us to bed with hearts praising the One who deserves all praise! Mel Anderson speaks to a visitor to the HBC glasses event. 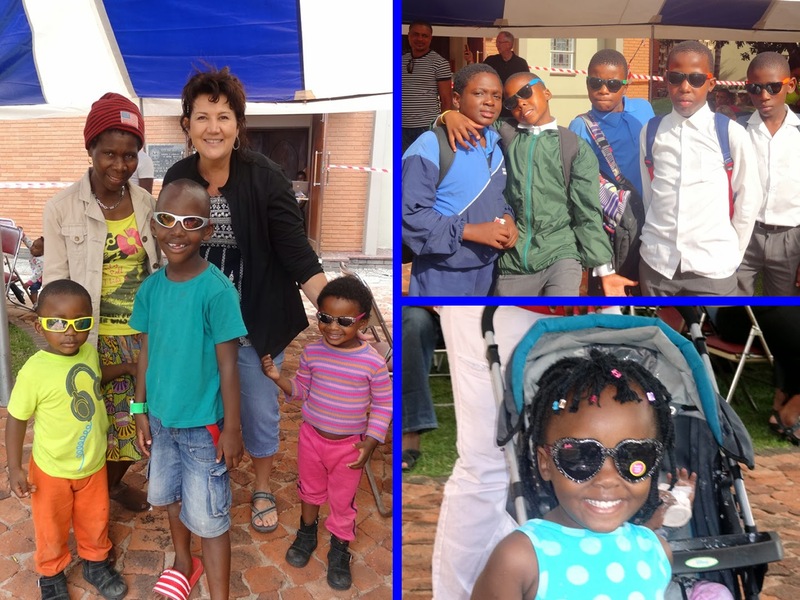 Even the many children were able to receive first-time glasses! along with her husband and daughter at home. 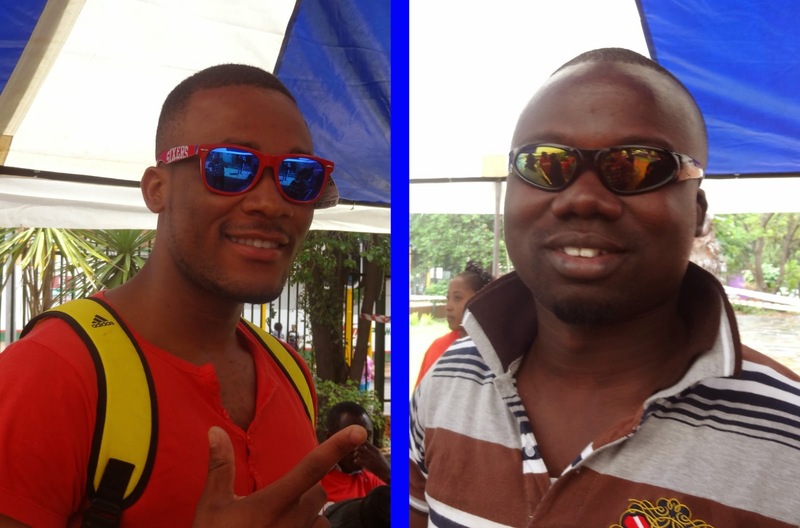 get a chance to try on some of the coolest shades in town. Day 3 - Glasses Distribution Begins! What a full day we have had, full on so many levels – full of praying, full of laughter, full of walking, full of talking with literally hundreds of people! We began the day with a trip to the Union Buildings, which is where the President of South Africa and his government officials work. It is a beautiful set of buildings overlooking the whole city. 2nd only to Washington D.C., Pretoria hosts the most embassies in all the world. Pastor Julius sees it as a strategic launching place for the Gospel to be spread and then taken back to all nations. We had a time of prayer for the city and what God was going to do today. After prayer (and pictures with the huge Nelson Mandela statue, which was just erected here this past December after his death) we headed to the church where we teamed up with several church member volunteers to give out 1,500 cards inviting people to Hope Baptist Church to come in the afternoon for free glasses. 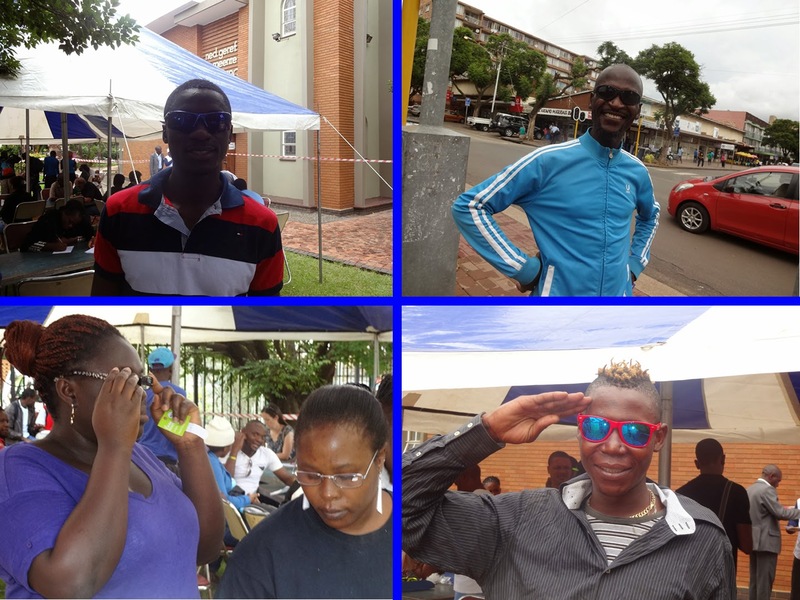 We separated into groups of 2 or 3 and walked up and down the main street of Sunnyside, Pretoria, which was a bustling hub of activity with people everywhere. Pastor Julius suggested we visit the “salons” and we wondered how few of those there might be in a half mile stretch of road. Well, we learned that there are a LOT of hair salons in Sunnyside and virtually all of them had business in full swing on a Monday around noon! It was strange for us, but neither the salon workers or the customers seemed to mind that we walked right in and started talking to them about the event! Most people were quite interested and asked us many times if the glasses we were speaking of were really free and many said they would come. In addition to the salons we talked to several people on the street and outside the shops and we handed out most all of the cards, telling them to come to the end of the street where the church building is situated, starting at 2pm. after most of the day's allotment was exhausted. After we found some lunch, we got back to the church where a large blue and white tent was setup with music playing, and the people began to come for their free glasses. 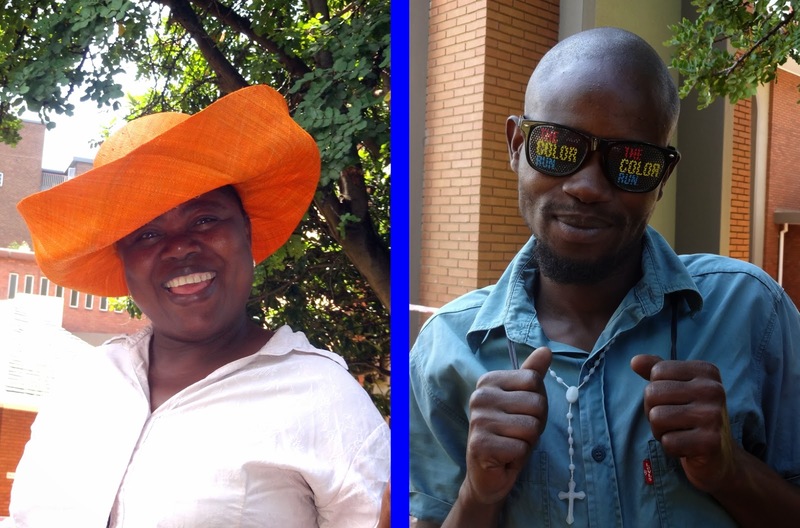 Before they were able to choose a pair of free glasses (sunglasses, prescription or readers) they were asked to meet one-on-one with one of our team members or the volunteers from the church. We introduced ourselves and gathered some information for Hope Baptist to followup later, but we (your FSBCS team and the volunteer church members from Hope Baptist) shared the Gospel today with approximately 200-300 people. We began many relationships and shared the best news they will ever hear! God allowed many divine appointments and we were able to ask them how we could pray for them and we prayed with them on the spot. There is one story of God's miraculous working that we must tell you. A lady came who spoke an obscure dialect. She sat with Mel Anderson first, but they couldn't understand each other. Three team members from the church came over at separate times to see if they could help translate but none of them understood her either. Finally, the lady looked over at Mel again and said "You help." They were then able to understand each other and Mel proceeded to go through the information form we were following to communicate with the lady. The other three church volunteers didn't know how they were understanding each other. Mel said it was God at work! We will continue the distribution of more glasses on Tuesday and look forward to many more opportunities to meet and pray with people and share the love of Jesus with them. We began our day with a wonderful breakfast and an informal team meeting. We were at Hope Baptist Church by 10 AM to greet many people and be a part of the pre-service praise and prayer time. For those of us on the team who had never been to the church it felt like we were walking into a dream we were remembering since we've seen so many pictures and heard so many stories. For those who have been before it was like returning to old friends. Cintia and Christina led worship and Pastor Julius brought a great message from Mark 2:23-3:6. His message communicated the truth that God doesn't have to work within the systems of man. We are His number one priority and He should be our number one priority. Praise God for the people who accepted Christ this morning during Julius' time of invitation. We were able to have wonderful conversation with so many of the church members and even first-time visitors and everyone was so very friendly and willing to talk to us. South Africa is a melting pot of Africa similar to Arizona is for the U.S. We spoke with people from Cameroon, Burundi, Ghana, Nigeria and other African countries, all now calling Pretoria home. Lunch and some down time took up the late afternoon. We had dinner with Pastor Julius, Cintia and the Evangelism Director from Hope Baptist named Emmanuel (who also happens to be driving us around as he is skilled in driving on the opposite side of the street with the steering wheel on the “wrong” side too – right turns can be exciting here!). After dinner we returned to the house where we are staying and began the task of cleaning, sorting and organizing the couple thousand sunglasses, readers & prescription glasses we brought to distribute. ﻿﻿Antoine was probably the highlight of the day as he drew a crowd after church with his sense of humor and friendliness. While we were cleaning and organizing the massive amounts of glasses he was the comic relief as he tried on many pairs of glasses that didn't fit or looked downright silly on him. The rain is falling in Sunnyside as we head to bed. As we listen to the refreshing rain we pray that healing rain comes to the souls of Pretoria. Travel Day(s) - We've Arrived! After a LONG journey on Friday and Saturday, we have arrived in Pretoria! Once we got Keith past the TSA in Phoenix, where he was "randomly selected" and privileged to spend some time in the Special Screening Room, we jetted off to Atlanta. From there, we quickly switched terminals and boarded our 15-hour flight to Johannesburg! We were greeted in the "Jo-berg" airport by Pastor Julius and a few helpers. In addition to our personal luggage for our 12-day journey, we each also brought a 50 lb bag filled with glasses, sunglasses, bibles and books and pre-school ministry materials that we will be distributing (glasses) or leaving behind for use by Hope Baptist Church, so we needed a little help in hauling all of those items. We were blessed in that we had no troubles with customs or security (outside of Keith's fun in Phoenix, which we're sure he'll tell you about if you ask him sometime) throughout this journey. After a short ride to Pretoria, we checked into our accommodations and went out for a nice dinner with Pastor Julius. Tomorrow is Sunday, so we will participate in the Sunday services at Hope Baptist Church in Sunnyside, Pretoria. Note the clock on the right side of this blog that will tell you what the current time is in South Africa as you're reading. 9 hours ahead of Phoenix, so it is 11:30pm in SA as we're typing this. South Africa Mission Team #4 Ready To Launch on Friday! The 4th South Africa mission trip team has been been preparing for many weeks now. We can't believe that our trip is right around the corner! 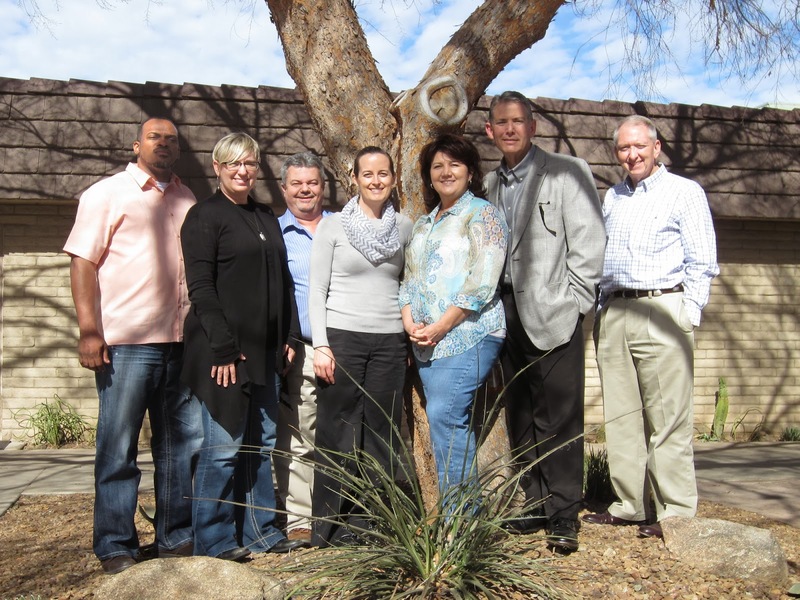 Our team consists of Keith Matney, Kevin Horton, Katie Miller, Antoine & Mel Anderson and Mitch & Mona McDonald. 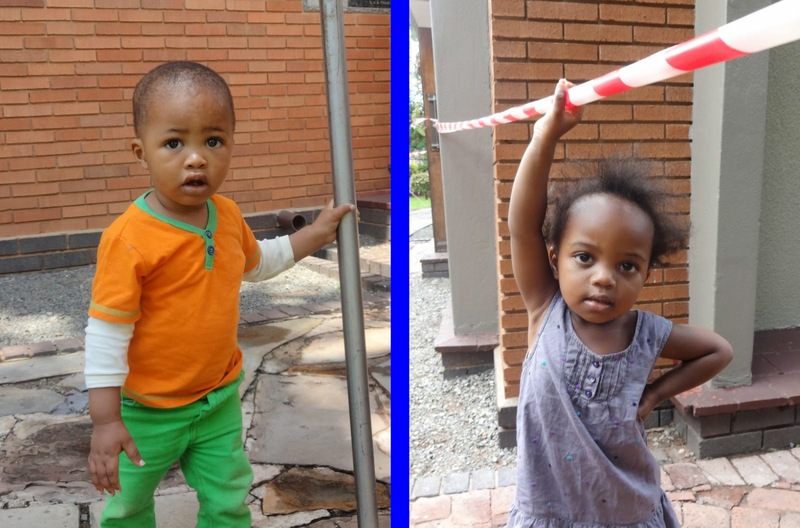 What a privilege for us to be able to represent FSBCS in Pretoria as we work with Julius & Cintia Mbu and our South African family of Hope Baptist Church. We all have stories of how God prompted each of us and made things work for us to be able to participate in this amazing trip, the way only God can. We depart the morning of Friday the 21st and will arrive the afternoon of Saturday the 22nd. (By the way, Pretoria is nine hours ahead of Arizona. We fly from Phoenix to Atlanta, and then a 15-hour flight from Atlanta to Johannesburg.) We will travel back to the US on Tuesday, March 4th -- arriving home on Wednesday the 5th. We anticipate this mission trip to be focused on one-on-one evangelism. We will be sharing our personal stories daily as a lead into sharing the Gospel. 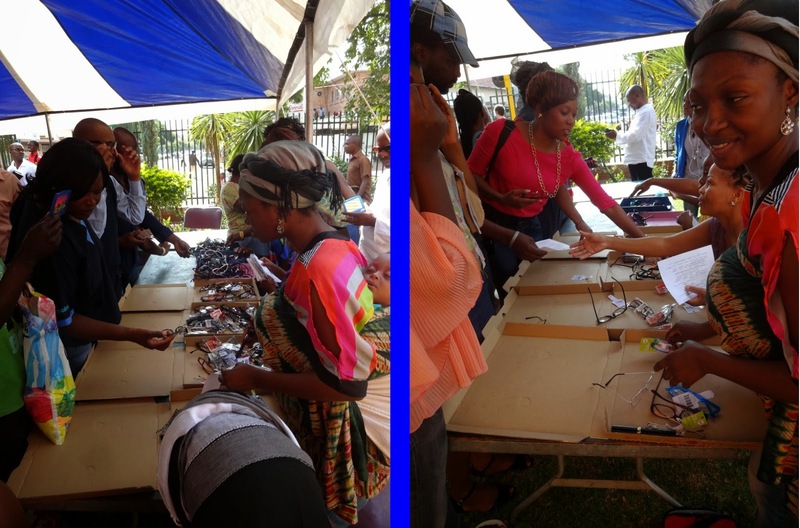 We expect to have MANY conversations sharing the hope we have in Christ as we hand out prescription glasses, reading glasses and sunglasses. We will also have the opportunity to be a part of a leadership training for children's workers and church planters. As you pray please know that this is your trip too. We're excited to be able to come back and share with you the great things God has done because of the support of your prayers! As long as our internet connectivity cooperates, we will try to post here regularly throughout our trip, so check back often!